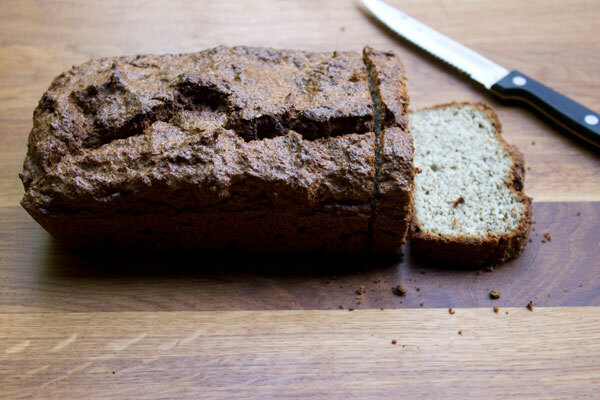 An abitmoreveg recipe for gluten-free bread – made with ground almonds of course. The way this recipe came about was that I was looking for a recipe for gluten-free bread made with ground almonds and the first recipe I found was something for which I thought I had all the ingredients to hand for Elizabeth Rider’s Almond Flour Bread. Except I didn’t. The recipe calls for ground flax seed. I just happened to have a packet of milled chia seed which I had picked up at my last trip to the supermarket on a whim – because I had no idea what chia seeds are. I figured there couldn’t be that big a difference between flax seeds and chia seeds. The recipe also suggest adding fresh rosemary and thyme leaves. I didn’t have any fresh and while I had dried versions of both I decided to just add dried rosemary. I don’t find much difference between dried and fresh rosemary whereas I think fresh thyme is amazing and dried thyme is very hard to taste in a recipe. Also in the original recipe cider vinegar is used but I didn’t have any so I used white wine vinegar and this worked great too. I also use less eggs, more oil and I added in water – I had to, that’s kind of an amazing thing about milled chia seed it really seems to soak up liquid like you wouldn’t believe. Although I changed quite a lot I would never have thought of adding rosemary to a loaf like this before so I’m really glad I came across that recipe and I intend to make the original one at some point – with all the proper ingredients. So what is chia seed? Apparently they are the seeds of a plant that is part of the mint family. They are high in fibre, good fat, protein and calcium. Also according to this article they can absorb up to 27 times their own weight in water and from my own experience I’d believe it. I think these milled chia seeds are great and I wouldn’t eat them dry but I’m certainly going to use them for gluten-free bread recipes the way they react with liquid make them a pretty great replacement for gluten – or so it seems to me. This bread works great as an accompaniment for soups or for sandwiches but it’s definitely has a savoury taste you couldn’t pair it with nutella and bananas or peanut butter and jam. Ground almonds, milled chia seeds, baking soda, eggs, honey, salt, oil, rosemary, vinegar and water – that’s what this loaf is made of. Line a 9 x 5 inch loaf tin and pre-heat the oven to 180 C.
In a bowl whisk up the eggs and salt and add in the oil. Whisk in the honey. Mix the chia seeds, ground almonds and baking soda together well. Pour in the egg-mix and combine together well. Stir in the water bit by bit letting the mix absorb what you pour in. When all the water has been stirred in, stir in the vinegar and mix around well. Stir in the rosemary. Add the mix to the lined tin and bake in the middle of the oven for 1 hour. When the loaf is baked take out and allow to cool on a wire tray. Lined a greased loaf tin with greased baking paper. I took it out after 50 minutes and to be honest it seemed baked at that stage but I’m so used to tapping loaves on the bottom to see if they are cooked, and this mixture is a bit more cake-like than bread-like so the bottom wasn’t hollow at all so I popped it back in the oven for a final 10 minutes. I took the baking paper off the sides of the loaf and popped it back in the oven – ensuring it was well-baked. To begin with I was just going to have the bread with butter and then I thought why not make something green and pink to celebrate the site’s new look. It was very gaudy – I was quite taken with it for a couple of weeks. Savoury gluten-free bread topped with beetroot butter bean dip, rocket leaves and goat’s cheese. The top of this loaf is nicely crusty – that was a surprise. And it slices well. I love this recipe.